After World War II, many newly affluent Americans had the means and desire to travel. Some visited the Pacific islands and Southeast Asia, while many more flocked to Mexico, California, Hawaii, Florida, and the Caribbean. People developed a taste for casual living and the distinctive local foods and drink. Returning home, they re-created these experiences in their new suburban backyards, with patios, tropical drinks, and the grill, where they cooked meals craved by a postwar meat-mad America. The outdoor patio grill created a new kind of space for American families. It associated food with recreation and relaxation. It also defined a special role for men in meal preparation: while they “manned” the grill to cook the meat for the main course, women worked primarily in the kitchen to make the side dishes. By the late 1950s, American manufacturers and retailers were promoting new tools, clothes, furniture, and serving ware to go along with grilled meals on the patio. 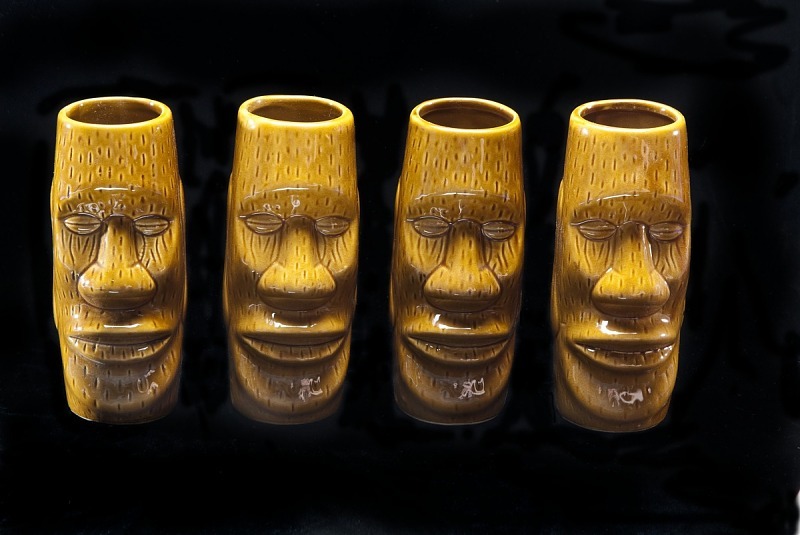 The restaurant and bar chain Trader Vic’s popularized many foods and drinks common to the backyard scene. Americans’ passion for tropical-inspired food and fashion played out in the new backyard grill culture. Pink plastic flamingos stood guard in suburban yards and men exchanged their workday suits for aloha shirts (once considered formal attire in Hawaii) or guayaberas (of Caribbean origin). They grilled on skewers, and served rum and tequila drinks instead of gin and scotch, inspired by tiki bars. Pupu (appetizer) platters were filled with eggrolls, fried shrimp, beef teriyaki skewers, spare ribs, and chicken wings, copied from restaurant bars and from magazines promoting these foods for cookouts and kitchens alike. Tropical hardwoods such as koa, monkeypod, and teak became popular in the 1950s and ’60s as a material for serving bowls, platters, and utensils. 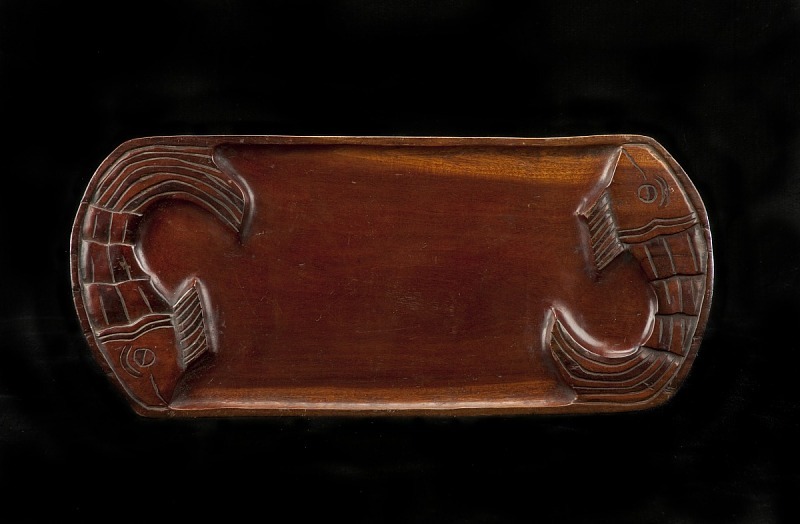 This teakwood tray has “Polynesian” decorations, similar to those found on glassware in tiki bars. It was designed to hold the Hawaiian, Asian, and Caribbean snacks of a pupu platter served with the mai tais, daiquiris, Singapore Slings, and hurricanes also popular with tiki followers. Gift of Nanci Edwards. Designed for Union Products by Don Featherstone in 1957, the pink, molded-plastic bird added a festive tropical flavor to suburban front and backyards and to urban frontage as well. 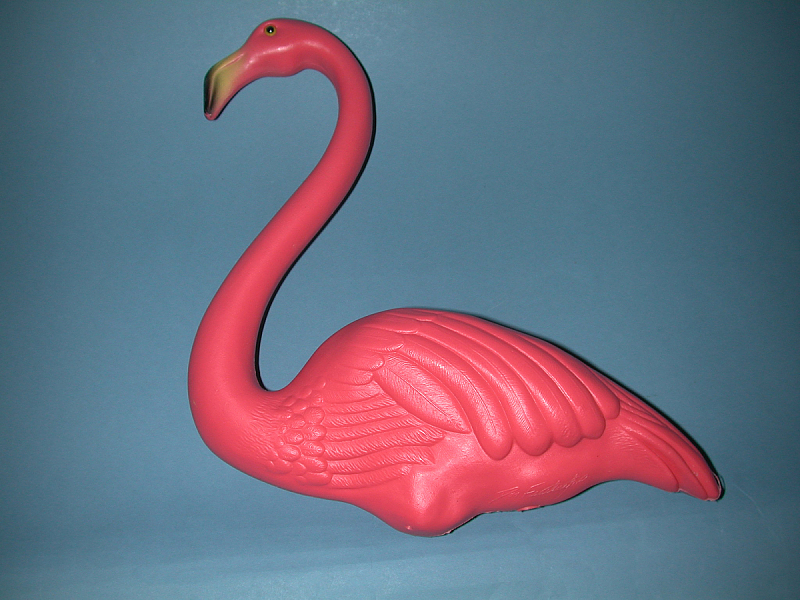 Over time, the pink flamingo—satirized in popular films and memorialized in university student pranks—evolved from simple lawn ornament into one of the perpetually loved icons of American pop-culture kitsch. It takes just one summer season to turn a caveman into an outdoor chef in full 1955 regalia. A man takes over with few more tools than a primitive hunter: a fire, a stick or an old fork, some meat. After one bite of a frankfurter he has personally charcoal-charred, he is hooked as a cook. Spurred on by his family, he pores over grill ads as avidly as a gardener studies seed catalogues, voraciously collects barbecue recipes, and splurges on the fanciest cook-out equipment he can find…. From little picnics, elaborate barbecues grow­­—and grow.